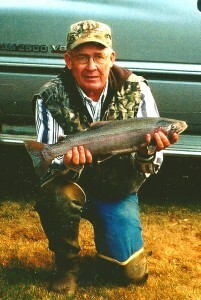 Patrick Miller, 72 year old Burley resident, passed away Sunday, July 6, 2014 at the Portneuf Medical Center in Pocatello. Patrick Miller was born on December 8, 1941 to Willis and Mildred Miller in Burley, Idaho where he lived his entire life. Patrick was an avid hunter and outdoors man. He worked from March 1, 1965 to his retirement on January 28, 2005 for Unity Light and Power and then United Electric Coop. Patrick married the love of his life ReNae T. Miller on December 31, 1976. He is survived by his wife ReNae; Children, Pam (Kent) Wetzstein, Blake (Gail) Palen, Judy (Gary) Hamilton, Patricia Jensen and Millie Miller. Patrick had 14 grandchildren and 25 great grandchildren. Funeral services will be held at 11:00 a.m. Thursday, July 10, 2014 at Morrison Payne Funeral Home, 321 East Main Street in Burley. Friends may call Thursday morning from 10:00 until 10:45 at the funeral home prior to the funeral. Arrangements are under the direction of Morrison Payne Funeral Home in Burley.